A: The Form 1098-T is a statement that colleges and universities are required to issue to certain students. It provides the total dollar amount paid to your student account for what is referred to as qualified tuition and related expenses (or “QTRE”) in a single tax year. Q: When will I receive my Form 1098-T’s? A: For those who qualify to receive one, Form 1098-T is available electronically on the 1098TForms.com website. Herring Bank provides a link on the AccessKC web portal. (A link is also provided on Kilgore.edu.) Students must specifically OPT IN to receive their 1098-T electronically. Electronically received 1098-T’s may be saved, printed, or emailed. For students who do not specifically opt to receive their 1098-T electronically, paper forms were printed and mailed from Herring Bank. Please allow 7-10 business days for mailed forms. Q: Is there a special circumstance that might prevent me from receiving my 1098-T? Q: Can I call the Business Office or see someone at the Cashier’s Window with questions on my 1098-T? A: The best and most accurate source of information about the amounts that you were charged will be the statements and receipts prepared for you during the year. You can access your account online through your AccessKC portal, and further information is available online at www.IRS.gov. The Business Office and Cashiers do not provide copies of prior student records and will refer you to this FAQ. Q: Why don’t the numbers on Form 1098-T equal the amounts I paid to Kilgore College during the year? A: There are potentially many reasons for this difference. First, QTRE does not include charges like insurance, room and board, which – though important – are not considered mandatory education expenses for tax purposes. Second, Form 1098-T reports amounts that you actually paid during that year. Effective 2018 (reporting 2019), Institutions are required to report payments received. The best and most accurate source of information about the amounts that you paid will be your Student Statements and Payment Receipts prepared for you during the year. You can access your account online through AccessKC. Q: Does the 1098-T include charges for books? A: No. You should consult with your tax advisor to determine if payments for books and other expenses and fees should be considered when preparing your income tax returns. Q: What semesters are included in my Form 1098-T? A: Typically, charges are posted to your student account in November or December for the Spring semester and as early as March for the other semesters. Depending on when you registered for classes, your Form 1098-T could include payments for different semesters. Your Student Statement details the specific dates when charges were posted to your account and is a valuable resource for determining the semesters that are included in your Form 1098-T.
Q: I graduated in May of 2017, do I have a 1098-T for 2017? A: Since the form is based on amounts paid to your account in 2018, there may not be any Spring charges if you registered before January 1. If you registered after December 31, however, you may receive a 1098-T form. Q: How do I prepare my taxes without a 1098-T? A: Kilgore College cannot advise you on how to claim tax benefits. We recommend that you seek the advice of a tax professional for tax-related information. It is the responsibility of each taxpayer to determine eligibility for educational tax benefits and how to calculate them. Q: My accountant says I need a form with information in Box 1 (amounts paid). I need an updated form. A: Your Student Statements and Receipts reflect payments posted to your account in the calendar year, and you may wish to provide them to your accountant in addition to your Form 1098-T. You can access your account online through AccessKC. Q: My SSN is wrong on my form. Can I have a new one sent to me? A: Some students may have incorrect SSN or taxpayer identification information on file if they either did not know or did not have accurate taxpayer identification information at the time they applied to the College. If your SSN is incorrect, you will need to complete IRS Form W-9S and deliver it in person to the Registrar’s Office (903)983-8607. Q: I took Continuing Education classes but did not receive a 1098T form. Consistent with IRS regulations, if you did not take any classes for credit, you will not receive a 1098T form. Q: What address was my 1098T mailed to? 1098T’s are mailed to the student’s current mailing address on file with the Registrar’s Office. If your address is not current, you will need to see the Registrar’s Office to correct the address. 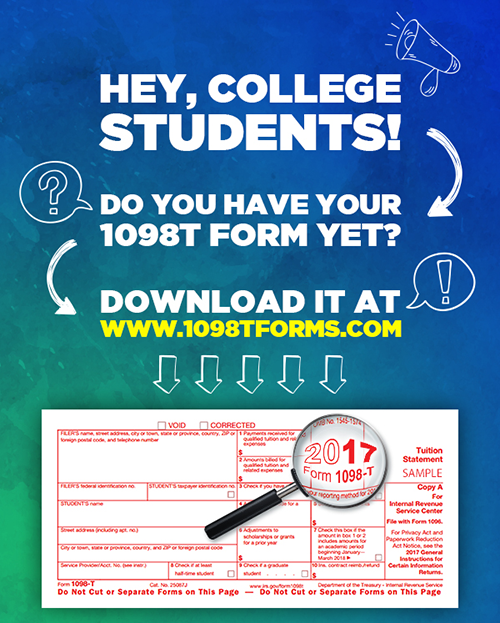 Eligible students may access and print their 1098-T at 1098TForms.com. Q: I don’t understand what to do with this form. HELP! A: We are unable to provide tax advice. For guidance you may want to consider IRS Publication 970 in addition to consulting a Tax Professional.